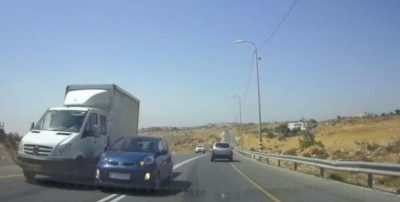 On Sunday afternoon, a group of Israeli settlers from Kiryat Arba settlement near Hebron threw rocks at Palestinians driving on Road 60. Israeli soldiers and police watched the rock-throwing, but did not intervene. Israeli settlers from Kiryat Arba are known to be among the most extreme and violent of Israeli settlers in the West Bank, frequently assaulting Palestinian civilians and attacking schoolchildren. Israeli soldiers stationed in Hebron are given orders not to intervene, as their role there is to control the Palestinian population, not the Israeli settlers. As such, Israeli soldiers frequently witness attacks by Israeli settlers against Palestinians but do not intervene. Ido Even-Paz of the group Breaking the Silence states, “Whatever a soldier believes when they begin their military service, there is no way to behave ethically in the occupied territories. It’s a system in which Palestinians are always treated as inferior, always viewed as the enemy, whoever they are. “Every day the job is to inflict collective punishment. We were told explicitly that we were waging psychological war, that we were there to intimidate them.